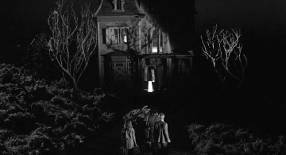 This web site is dedicated to the movie The Haunting, a 1963 masterpiece directed by Robert Wise, starring Julie Harris, Claire Bloom, Richard Johnson and Russ Tamblyn. In its full black and white glory, The Haunting is widely regarded as la pièce de résistance of the ghost movies genre, la crème de la crème, a must-see for all the connoisseurs. 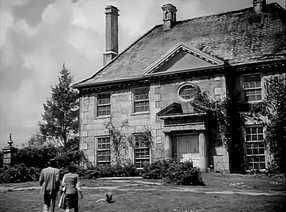 To conduct his experiments with paranormal phenomena, Dr. Markway gathers a team in an old mansion, reputedly haunted. During the first night, the guests are terrorised by strange noises. Eleanor is on the brink of depression and the Dr. Markway advises her to leave. She refuses, claiming that the house holds her back. The Movie page (this page) is about The Haunting, the 1963 movie. From the technical details of the shooting, to the pictures of the delete scene, and up to an analysis of the psychology of the characters, it is meant to cover every aspect of the movie. The Books page is about The Haunting of Hill House, the 1959 book written by Shirley Jackson, that inspired The Haunting. It also features a comprehensive analysis of the book, as well as other suggestions of reading about Robert Wise or the movie. The Videos page is dedicated to all the video releases of The Haunting. From the oldest VHS/LaserDisc editions to the most recent Blu-ray editions. The House page is dedicated to Hill House aka Ettington Park, the mansion where the exterior shots of The Haunting took place. It also features a section about the Elstree and Borehamwood studios (MGM British Studios), where in the interior shots took place. The Promo page is dedicated to all the promotional memorabilia for The Haunting. Film stills, posters, lobby cards, MGM documents, and so on. The Paranormal page is dedicated to the paranormal events depicted in The Haunting. The People page is dedicated to the people who made The Haunting possible: The director, the actors, the screenwriter, the book author, the music composer, etc. The Journal page is the Journal of updates about this site dedicated to The Haunting, so that you can catch up with recent updates if you are a regular visitor. I need to state that all the screenshots depicted on this site have been digitally "reworked" and "enhanced" with appropriate photo editing tools to look better on LCD/OLED displays (as opposed to CRT displays). What you see here is not what you will get if you buy a copy of the movie. They were lacking "deep blacks"
Well I simply tried to fix that for all the images that I wanted to display on the site. I invite you to visit the Videos section for a general discussion about the image quality. The shots of the film were made between October and December 1962. Source: Conclusion drawn from the reading of various issues of the Kine Weekly magazines (UK) and their weekly listing of the current productions in various studios. These titles were considered as possible movie title. Source: Warner DVD + Nelson Gidding interview. The headline A tale of fear was also considered. Special Effects: Tom Howard, F.R.P.S. See the page dedicated to The House for more details. London, UK, Europe: corner of Coleman Street and London Wall, at the North end of Coleman Street. The one with the road sign is the view from this corner looking East at the North side of London Wall & (in the distance) the East side of Moorgate (with 74 Moorgate on the far corner). The one with Eleanor leaving the "Boston underground parking" is again a view from the corner (at the top of where the slope down to the car park used to be), looking South down Coleman Street, with the re-built Armourers & Brasiers building on the East/left. All taken from "Robert Wise on his films, from editing room to director's chair", by Sergio Leemann. I was reading one of the very scary passages — hackles were going up and down my neck — when Nelson Gidding... burst through the door to ask me a question. I literally jumped about three feet out of my chair. I said, 'If it can do that to me sitting and reading, it ought to be something I want to make a picture out of'. The exterior was a several-hundred-years-old manor house out in the country... It was a pretty horrifying-looking thing under certain kinds of lights, and I accentuated that by shooting some of the exteriors with infra-red film. I shot the film in Panavision and, at that time, there wasn't any wide-angle lens in anamorphic... I wanted to make those hallways look long and dark and dank. — 'We have developed a 30mm, but it is not ready for use yet. It has got a lot of distortion in it'. — I said, 'That's exactly what I need for certain places. I want the house to look almost alive'. The spiral staircase in the library was such an effective prop in the picture. It was scary when you were up on that thing and it was rocking around. The one shot we did on it that fascinates people the most is when the camera is at the bottom and goes up. We designed the banister of the stairway to be so wide and thick that it would fit a small rig with wheels on it — a little, light dolly that would hold a hand-held camera. We had our camera on that and we had a control wire underneath, all the way down. We simply took the camera up to the top on this rig, started it, rolled it down, and then reversed the film. It was all done on that balustrade. Another simple effect was the door that buckles. The door was all laminated wood, layers of wood on top of others. All I had was a strong prop man on the other side who would push it and move it. That's all it was and it scared the hell out of everybody. I feel very privileged to own a copy of an early version of the screenplay. I write "early version" because there are numerous differences between this version and the one that was eventually used for the movie. For instance, the introduction to the house is given by Mrs. Sannerson, and not by the Dr. Markway. More interestingly, this version also includes the deleted scene with Theodora having an argument with her girlfriend before leaving for Hill House. Well, too bad ONE page — page 12 — is missing, and out of 132 pages, it is just the one in the middle of the deleted scene. In any case, I'm very grateful for this great document. I have a PDF version which is a scanned copy of a document that was photocopied (Xeroxed) several times. Consequently, there is room for improvement in the quality. As a dedicated fan, I decided to recreate a brand new, clean version... The first step was then to extract all the pages, as PNG images. As an illustration, this is page 15. The next step was to clean these PNG images (pages), one by one, manually. In practice, I removed all the black spots and dots to have a pure-white background. If needed, the pages were straightened (some are oblique). Then I reworked the text, to make it darker. The malformed letters were manually restored. After this step, I had a clean version of all pages, as PNG images. I was able to recreate a brand-new look-a-like version in PDF, this time with clean pages. More importantly, these clean PNG images were used as the source for an OCR operation — OCR meaning a software for Optical Character Recognition. As a result, I had a pure text .TXT version of the screenplay. Then, with Word, I formatted this pure text to get a more modern screenplay, still very faithful to the original — same page layout, same numbering scheme, classic screenplay formatting. I also corrected obvious mistakes — for instance, Theodora mentioning "My mother" or the Dr. Markway, by the car, saying "He's dead". At this end of that lengthy process — nearly 100 hours of work — I have a clean Word .DOCX version as well as a new pristine clean PDF rendition. 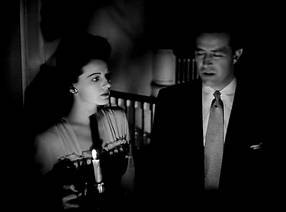 The movie was based on the novel The Haunting of Hill House (1959) by Shirley Jackson. 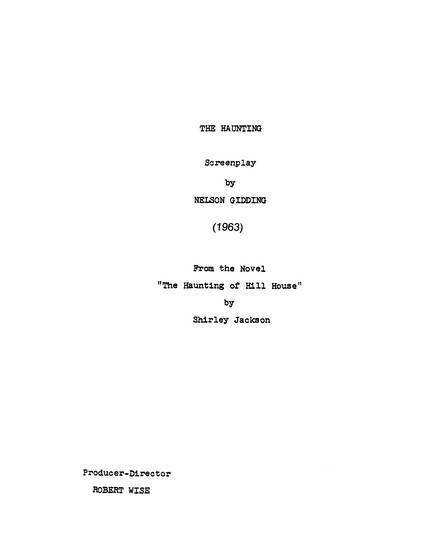 According to Robert Wise, Shirley Jackson herself suggested the title The Haunting for the movie; title that she also had considered for the book. The story was brilliantly adapted for the screen by Nelson Gidding, who made numerous changes in the original story. Eleanor was just not allowed to be happy. She had nowhere to go, no one to hold in her arms, no job, no money, no friends, nothing... She could not remember ever being truly happy in her adult life. She had spent all this time — 11 years — taking care of her invalid mother, until she died. Disconnected from the real world, Eleanor's life was made of small guilts, small reproaches, constant weariness and unending despair. It just wasn't fair. All she wanted was to be cherished. The only person in the world she genuinely hated, now that her mother was dead, was her sister. Eleanor didn't think twice when she received this strange invitation from Dr. Markway. She was ready to go; she would have gone anywhere. Somewhere where she would belong. Leaving all this past behind. She ended up in Hill House, and thought she could be happy there. She was indeed happy in Hill House, but just for a while. Scandal, murder, insanity, suicide... The history of Hill House was ideal. It had everything I wanted. It was built 90 hard, very hard years ago by a man named Hugh Crain as a home for his wife and daughter is the most remote part of New England he could find. It was an evil house from the beginning, a house that was born bad. A team of four researchers specialized in the analysis of supernatural manifestations. Except that some of them didn't know they were researchers. They didn't even know why they were there and what was going to happen. No one knew what was going to happen. They had forms to fill up every night — very scientific — to keep track of the events, as any professional would do. Dr. Markway didn't know what to expect from Hill House but he surely received much more than he had probably ever anticipated. Eleanor started it all. The house wanted her from the beginning. The show started the very first night, with Eleanor being the obvious centre of attention. Eleanor was willing to accept a lot for his sake. And she did. She accepted too much. She was given a last chance in the park. She could have turned her car around and gone away. But she was already running away and had nowhere else to go. So she stayed... and broke the spell of the house. A strange relationship between Eleanor and Theo. It all started with a pure and innocent young girl, Eleanor, looking for good company, looking for a place in a group, looking for someone who would cherish her. Well, she wasn't exactly that innocent and she quickly found out who she wanted. But, so inexperienced, she was too blind to see what was really going on. Theo also knew exactly who she wanted, but it wasn't quite socially acceptable I suppose. Anyway Theo couldn't care less. 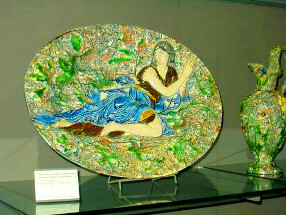 Theodora's world was one of delight and soft colors. She wasn't used not to getting what she wanted, and at once. Indeed: the human needs, fears, beliefs, driving forces, values, desires, priorities, joys and sorrows. Eleanor — our heroin — represents the human race, and its fragilities. Eleanor is a lonely creature, desperately looking for love. At the end of it all, isn't it what we are all looking for? More than money, more than fame, more than anything else? Love. Somebody to share our innermost thoughts; somebody who would stand by our side, for the good and the bad; somebody who would know our intimate details; somebody who could hear our darkest secrets and alleviate our childish fears; somebody who would be supportive, protective and yet not possessive; somebody to lean on... According to some studies, humans are — with dolphins —, the only mammal that can die of sorrows. Love (more precisely the lack of love) can effectively drive humans to madness or worse, to death. Eleanor, ignoring all the warnings, all the bad signs and all the red flags, purposely accepts the danger of the situation. She voluntarily chooses to stay at Hill House. Whatever the price, she'll pay. Her survival instinct screams to get out; a little voice begs her to run away; her common sense demands to leave the place at once. She is perfectly aware that she must leave for her own safety. "Better to be safe than sorry" they say... But the poor creature desperately hopes that something good is about to happen — something, at last, happening to her — and is ready to put her life in the balance. And we who walk here — walk alone. She is obviously the main character of the movie, equally with Hill House, of course. She is 32-year-old, charming, a bit simple but mainly because she didn't see the world yet. She was a bird in a cage. She didn't experience many things on her desert island and so she is very naïve, emotionally fragile and a bit clumsy in her relationships. You do not know much, you do not see much of the private life of the other members of team. But you see Eleanor at home, with her sister. You see Eleanor taking the car at the garage; an important decision in her life. You follow Eleanor's journey to Hill House. Most importantly, you know her thoughts, her intimate thoughts. You see the whole movie through her point of view; you are on her side. Eleanor is a complex character. Eleanor is rather unlucky and you immediately feel sympathy (not pity) for her: she has to beg to borrow a little car — that is nonetheless half hers; she lives at her sister's, pays a good part of the rent and yet sleeps on a couch in the living room. Up to now, Eleanor had a sad and dull existence, made of unpleasant work for which she has never been thanked or appreciated. She cannot remember being happy in her adult life. Her life is a continuous world-weariness and an endless despair. Eleanor is stifled, tormented by her past, haunted by unhappy memories and suffers from extreme mental distress. Eleanor knows from the very beginning that there is something wrong. Just as she approaches Hill House for the very first time, she strongly feels, obscurely feels that it is her last chance; her last chance to get away. Still, she purposely chooses to continue and to ignore these warnings. Once in Hill House, she accepts too much from the house for John's sake. Anyone, more reasonable, would have chosen to run away after the first events. Again, Eleanor ignores all the red flags. She prefers to continue a dangerous relationship than to be safe, but alone. John Markway contacted her because, when she was a child, Eleanor had a Poltergeist experience: showers of stones fell on her house for several days. She is very reluctant to talk about it and almost denies it ever happened — many believe that Poltergeists are the manifestations of unbalanced teen-aged minds. It doesn't take long before Hill House really makes Eleanor the center of all attention. The house has found a kindred spirit in Eleanor and consumes her; she is disappearing inch by inch into the house. Eleanor has been hoping and waiting for something to happen. Something, at last, really, happening to her. Something truly extraordinary, like Hill House. That is why she got so exited when she got the invitation-letter from John Markway to spend part — or all — summer in a country House for some... experiments. Once in Hill House, she is scared and yet morbidly fascinated by what could be her dream come true. Eleanor spent all her adult life taking care of her invalid mother, until the mother died. She had no social life, because she had to be constantly at home. This eleven-year long and time-consuming devotion did not provide her any satisfaction, on the contrary. She didn't get any gratitude or appreciation for this sacrifice. Mother was apparently very demanding and refused that Eleanor could have a little time for herself, on her own: she called and banged on the wall when Eleanor was taking a little time off, playing solitaire in her bedroom. She had to be constantly available. She was denied the right to have a life of her own. She was there to serve. For many years, this growing tension probably led to a lot of frustration. Eleanor has mixed feelings about the death of her mother — a mother she probably hated after all she endured. Eleanor feels relieved because she is free, at last, after eleven years on a desert island, as she says in a scene. But she also feels guilty because we know that the mother died because, one night, although the mother was banging on the wall, Eleanor didn't wake up to bring the medicines. She has been wondering ever since... Did she wake up and go back to sleep immediately? It would have been easy. Didn't she really hear anything? Is it an accident? A murder? Or just fatality? The death of the mother has a really high importance in the story. Along the movie, Eleanor keeps on saying Mother says... or keeps on referring to her as She. Now that her mother died, Eleanor hates her sister, Carrie, who blames Eleanor for the death. Eleanor is psychologically and physically exhausted. Her back and hands hurt. It wasn't fair: she didn't get any help at all for all these dirty chores, although the family could have afforded a laundress. All the workload and responsibilities were on Eleanor's shoulders. She has been "used", "abused" and denied any existence of her own. Still, her sister dares to question Eleanor's devotion and says I don't suppose poor Mother's wishes mean much to you — which makes Eleanor rightfully furious. Eleanor was confined, held captive in a small world. She thinks she wasted a lot of time — she has been wondering what had been done with all those wasted summer days? ; some time that she wants to catch up with, and right now. She seems clumsy in her tentative to connect, to relate to someone. We learn from the very beginning that she does not drink alcohol – which makes sense for someone who never had adult relations, companions, friends, in the outside world. If you never go out, never attend parties with people of your age, it's very unlikely that you will develop a taste for fancy cocktails. Her trip to Hill House is like escaping from jail. She feels that she is running away from this hideous past, well decided to start – at last – to enjoy this life. Furthermore, she plans never to come back. Otherwise, why would Eleanor come to Hill House with ALL her belongings? Did she plan or did she know? Eleanor is very afraid of being rejected by other people. She keeps on saying You wouldn't leave me by, would you? or ... unless of course you want to get rid of me... or I have a place in this room. These people are my friends. I belong. All that she wants is to find love; she desperately needs to be loved. She keeps on looking for understanding, love, companionship and friendship. She repeats, Journeys end in lovers meeting. She fancies John Markway but she doesn't know or she is too naïve to realize that John is married. The days and nights are really tiring and frightening in Hill House but she takes it all for his sake. It must also be said that John's attitude is highly ambiguous: sometimes he is protective like a father, sometimes he is openly flirtatious with her (he even caressed her cheek). To find out that John is married will become another major disappointment in her life. On her way to Hill House, Eleanor starts to dream about how her life could be. A daydream. A house, a pair of stone lions and she starts building up scenarios about how her life could be. Once in Hill House, she makes things up and doesn't tell exactly the truth about her life. She is really aware of how dull her life is. She wants to change it all for something better and she thinks that Hill House is the beginning of a new life for her. She says They would never have suspected it at me... I would never have suspected it at myself... I'm a new person. An alternate reality seems to exist for real in Eleanor's head, in strange movies always starring Eleanor against the rest of the world. The question is: do these daydreams and innocent little lies come from a candid personality, or are they the preoccupying first signs of genuine, deep, far more serious psychological problems? Is it charming or dangerous? We guess from the very beginning that Eleanor has almost no money. She owns half of a little car, with her sister Carrie. She is homeless and lives at her sister's house. All that she owns can be packed in a single suitcase and a cardboard box. She has no job, no friend, no-one to love, no money, nothing. That's a terrible thing to say. Let me explain. Why is it so that Eleanor had to devote 11 years to her ill mother, whilst her sister Carrie was relieved from any constraint? Carrie was apparently too busy to provide any help, while dating, marrying, founding a family – maybe also first getting an education, a job – getting a house and a financial security? All those things that Eleanor was totally denied access to. When a parent is sick, is it normal to "assign" one daughter to the everyday care whilst the other daughter is free from any assignment or responsibility? If the sister cannot be there for a good and solid reason, shouldn't it be normal to request that she provides – at least – a financial support to make life easier? Although the family could have afforded a laundress, the monstrous mother probably decided that Eleanor could do it – for free. Eleanor was there to serve : a slave has no right. End of discussion. Some horrible parents – that are called "toxic" nowadays – don't see their offspring as a seed to grow and nurture, but only as a resource to use, whatever the price, whatever the permanent psychological damages they inflict. Last but not least, at the very end of the movie, wouldn't you say that the house is willing to return Grace in exchange for a permanent hostage, Eleanor, killing the later in the operation? The ultimate sacrifice. There is a clear parallel between Eleanor's life and Abigail's. Both endured a traumatic experience during their childhood: Abigail's mother died; Eleanor supposedly caused a poltergeist. For different reasons, both lived a life of complete solitude, had no lovers, grew old and eventually became spinsters. Sadly, both died all alone, violently. There is a clear parallel between Eleanor's life and the companion's life. Both take care of an invalid person during a long illness. After the death of the sick person, both are accused of neglect and of being responsible for the death. Both also died all alone, violently. Have you noticed that, in this movie, the female characters are vastly more complex and more interesting than the male characters? Theodora is quite an example. She is gorgeous, icy, sophisticated, independent, dressed in black haute couture and very clever. Theo is clairvoyant and has a gift of ESP; but she feels open and comfortable about it. Theo would probably like to be the center of attention. Although she displays a very self-confident attitude, Theo is probably not as strong as we might initially think she is. When the house gets wild, Eleanor is much stronger than Theo... But I think Theo would not change a thing in Theo. We do not know much more about her, really. Theodora or Theo is the only name she has. Just Theodora as she says. We know that she lives in couple but is not married. She avoids making any statement that might reveal the gender of her companion. She uses "we" instead. But do not conclude that Theodora is hiding anything. Theodora is lesbian but this part of her personality is — subtly — expressed in the film, although more freely expressed in the original book. When you guess, when you add all the details, you understand that she is obviously a lesbian. Theodora would probably openly answer Yes! to the question Are you lesbian? When Eleanor first meets Theo in Theo's bedroom in Hill House, Theo immediately calls Eleanor Nell, which is the affectionate term for Eleanor. They have just met, hardly know each other and Theo feels like chatting with a friend already. Later, in the same conversation, Eleanor says, We are going to be great friends Theo! Then Theo asks Like sisters? The first evening at Hill House, before dinner, the team has a drink to chat a bit and learn about each other. Eleanor says I'd like to drink to just us... good companions. Theo stares defiantly at Eleanor and says Excellent! ... To my new companion! Later, Theodora is asked to move in and share Eleanor's bedroom. Eleanor is a bit reluctant to accept it because it is the first time that she has a real bedroom, her very own room. Theodora consoles Eleanor and exclaims, Don't get all hung up, Nell. We'll have fun... and then adds, laughing, to the doctor... like sisters! When Eleanor and Theo spend their first night together in Eleanor's room, Theo tells Eleanor When I'm through with you, you'll be a different person. When Theo decides to leave, she doesn't plan to leave alone and wants to take Eleanor with her. She says I'm taking Nell and I'm clearing out of here! When Eleanor is struggling to stay at Hill House, Theo is nicely packing Eleanor's suitcase. When Eleanor, leaving, is about to start the engine of the car, Theo gives her best wishes to Eleanor: I thought you weren't going to say goodbye. Nellie my Nell, be happy, please be happy. Everything's going to be all right. I'm sure Grace is here and we'll find her. So don't worry. The male characters are both much simpler, and much easier to understand. John is the wise guy, the one who wants to experiment but, also to control and limit the risks. He feels responsible for the safety of the team, since he dragged all the other characters in this adventure. He is a scientist, although the topics he is studying are at the border between the scientific and paranormal investigations' fields. He is fascinated by the house, but wants to make sure that no-one gets hurt. He rescued Eleanor several times, taking risks for himself doing so. Professionally, he is responsible and protective. On the other hand, he is personally really ambiguous. He doesn't feel the need to state that he is married. When his wife shows up unexpectedly, she has to ask Didn't John tell you he is married? With Grace, he doesn't behave like a loving husband (and Grace doesn't behave like a loving wife either). With Eleanor, his flirting attitude is dangerous however, because Eleanor is emotionally fragile, and she might believe that John also has a crush on her (and indeed she does believe that John has a crush on her). Sometimes he behaves like a flirting lover, sometimes like a father, sometimes like a cold-hearted selfish scientist. It is just like a shower that runs hot and cold, hot and cold, hot and cold... I believe that, in the music room, he was just about to tell Eleanor he was married, when the harp suddenly started playing by itself. His scientific experimentations in Hill House are probably more important than anything else and the harp gets all his attention. He just forgot what he was about to say to Eleanor. Luke is young, careless and light-hearted. He was born in a wealthy family. He has no other preoccupations in life than to enjoy himself. He probably enjoys going out in sports cars, drinking a lot, partying all night and fooling around. He probably didn't earn any of the dollars he is spending. That is the reason why nothing seems to be really important for Luke: he never faced the harsh reality that lots of common people have to endure. Eleanor struggles in financial difficulties; Theo lives her life openly (and being lesbian was probably not that easy at that time); John had to study seriously at university to get his high social status. Luke just didn't face any of these constraints: he didn't have to. Luke was born to have fun. It is that simple. Alcohol seems to be very attractive for him. I would not say he is alcoholic, but there is an obvious tendency to drink alcohol whenever possible, even in the middle of the night. Socially drinking with friends is something. Getting up to drink alcohol in the middle of night is more worrying. What makes The Haunting so special? The Haunting is a multi-layered movie, that can be decrypted/seen at different levels. These different ways, to understand and to appreciate the movie, make that a lot of different people get interested in this masterpiece. 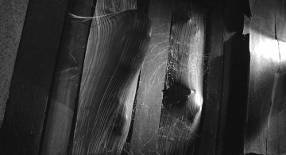 At the surface, it is a ghost and haunting house movie, superb in its black and white glory. The story perfectly follows the classic path: a magnificent sinister old gothic mansion, abandoned for a long time, complete with suicides, unexplained deaths and mysterious dark chamber. A team comes in to explore the phenomenon, and their expectations are fully fulfilled. Decades after its original release, the movie remains highly considered and grandly appreciated because it is ageless. Instead of using cheap special effects tricks to show ghosts and other strange events, Robert Wise — who was definitely a genius — used our fear of the unknown, of the unseen, of the unreal. The terror largely comes from the soundtrack, from the fear of "Who or what is behind the door? ", "Who or what is pounding on this wall? ", "Who or what wrote this in the corridor? ", "Who or what is secretly staring at me?". Nothing is seen. Everything is suggested, especially with strange distant noises and eerie sounds. Lots of people do praise the superb black and white images. Strangely, only a few people do pay a really good attention to the background music. I strongly believe that this great sweet and melancholic music was the perfect choice for the soundtrack. I wish it had been released on record at the time. The movie proves that a black & white rendering can be a strong, valid artistic choice, and not necessarily a technical constraint. That choice still remains valid today (for instance, with recent movies such as Mad Max Fury Road — Black & Chrome edition). From that perspective, The Haunting is perfectly executed, with the great addition of sequences captured with some infra-red film, to create a dreamy, unreal feeling. You might have missed it, but the camera rarely follows the action. It scarcely follows the characters as they move on screen from one room to another. The viewer can lose the directions, because the rooms in Hill House then seem unconnected. It is almost impossible to draw a map. Instead, the camera acts like the eye of a living entity. On numerous occasions, we have the feeling that the house itself is watching the characters. It is obvious when Eleanor first arrives in the premises: the house watches its new prey. On other occasions, we see the action as the characters supposedly see it too. When the first Mrs. Crain falls down the stairs and dies, we see exactly what she sees: the entrance hall, upside down. Last but not least, I think that the idea to add a voice over is a genuine masterstroke. Instantly and very naturally, it gives us a raw access to Eleanor's innermost thoughts. It helps us understand her motivation, her fragilities, her hopes and despair. These artistic choices made by Robert Wise were quite unusual at the time and demonstrate his professional competence and mastery of subject matter. All these elements, carefully thought out, provide a timeless quality to the movie. Below the surface, it is the story of Eleanor, who lived and died too young, lonely and unhappy. We cannot help but think that is it just not fair. We feel so sorry for Eleanor, who has done nothing wrong: it is the other way around. She spent all her adult life taking care of her invalid mother, until the mother died. How was she rewarded for this devotion during all these tough years? Well, she was not rewarded at all: she just spoiled very valuable years, missed chances to meet someone, and was left with no money and reproaches from her sister, who blames Eleanor for the death of the mother. For a while, we think that Eleanor finally received the chance she had long deserved: the invitation at Hill House is her first chance for a vacation in all her adult life. As she arrives, her survival instinct screams to get out of the place. But Eleanor has been waiting so long for such a thing to happen. Something, at last, happening to her. It doesn't take long to realize that it will all go terribly wrong, through hopes and disappointments, eventually leading to the death of our poor beloved heroine. Eleanor is fundamentally a good person, a caring person, and like anybody else she deserves to be happy. She deserves to meet someone who will love her, someone who will take care of her (for a change). We all have been brought up with the strong precept that good people are always rewarded for their goodness and generosity. But as an adult, we know it is often very wrong, and this leaves us with the bitter feeling, the strong conviction that it is so unfair. If you dive even deeper, the movie raises a general and fundamental question about the meaning of life, and the possibility of life after death. After all, who or what are these entities trying to communicate with Eleanor? What is the meaning of all this? What are they trying to tell us? Some might object that Eleanor is insane, and that all this is just a trick of her disturbed mind. But in that case, how come that Theo and then the whole team also experienced it? After her death, Eleanor doesn't leave Hill House. Still lonely, she continues to exist in the house, but in a different, immaterial, form. The soul of our poor Eleanor will remain in the place she cherished so much. Her tormented soul will continue to suffer, forever. Depending on your preferences, interest, own experience and sensibility, you will see the movie at a different level. There is food for thoughts for everyone. Some fans will focus on the house and its mysteries; some others will focus on our poor tormented Eleanor. With such strong female characters in the movie, it is a little bit funny that most of the fans who contacted me in the past 20 years are men, and practically no women. What will make a fan most akin to Eleanor? I am not a trained psychologist, but I tend to see a general pattern in the profiles of the fan. Eleanor gets all the attention of the people who suffer or have suffered from loneliness, general disenchantment, disappointments in relationships, unrewarded generosity, and maybe people disappointed in life, in general. All fans are all welcome to contact me. I am just surprised that the lesbian character of Theo, who is positively depicted as a good, caring and flamboyant person doesn't get more attention from the community. On a DVD (French DVD, The Innocents, in the bonuses) that I was about to discard in exchange for a Blu-ray edition, I found a very interesting analysis of the haunted-house/fantastic movie genre by Alexandre Tsekenis that also totally applies for The Haunting. I translated it, summarized it and added references to The Haunting. The entry of the character into the estate is very important. It doesn't happen accidentally. The character must go through a majestic, impressive door, that represents the boundary to another world. This gate allows to pause for a moment, to highlight the significance of this act. It also clearly states that the access to the house is actually quite difficult. That's especially true with Mr Dudley keeping the gate and delaying Eleanor for as long as he can. We don't know clearly if he's trying to deter visitors from entering the sinister house — to save them — or if he's just abusing the situation to assert his very limited power and to keep the guests waiting — to mark his brief superiority on them. The mansion is isolated from the rest of the world, hidden in the nature, in a remarkable park. The park takes the form of a little forest, in the case of Hill House. The style of the house is neo-Gothic, asymmetric, irregular, mysterious, tortured. This large silhouette gives the feeling of an impressive mass. Inevitably, the heroin is very impressed by this huge, unexpected house. Eleanor brakes suddenly as the house appears after a bend on the road. It takes a moment to recover from the surprise. Moreover, Hill House seems alive from the beginning: it feels as if it were observing Eleanor approaching the front door. Inside, the house could be described as a mix of Victorian and gothic, with an abundance of decorative objects. The furniture is antique, strange and sometimes way too big for a modern life. The rooms often feature big fireplaces with impressive mantelpieces. The bright day light is not welcome. The rooms are very dark, due to the dark wooden floors, walls, furniture, and aggravated by all the opaque curtains, net curtains, tapestry, upholstery material, etc. The numerous statues — and especially the life-size ones — seem to watch and spy on visitors, as if they were alive. And of course, there are the monumental stairs, almost a cliché. At the very beginning, the house is quite welcoming and charming; soon after it becomes worrisome and threatening. In the dark, strange shadows and sombre corners make the heroine very uncomfortable. Have you noticed these details? Patricia Doyle (actress) was Robert Wise's wife, from 1942 until her death on Sep 22, 1975. The story goes that the names on the chalkboard were all friends or family of writer Nelson Gidding. Albert Trepuk was his stepfather, Charles Stern, Ruth Murray, Rufus Matthewson, and Paul Kirschner were friends, and Joshua Walden was his then 14-year-old son. The classic office you would expect to see in the sixties. Complete with telephone, lamp, typewriter (the one used to send the letter to Eleanor? ), bookshelf, chests of drawers,... a cluttered space, the usual mess. But how come there is a poster of Mendel's first law of genetics (law of segregation)? My dear "haunting" fellows, what a shock! Mother is here and has always been! Yes, a picture of Mother on the mantelpiece. Look closely and the doubt is not possible. Who else would be on the mantelpiece? I have watched this movie countless times, once in a movie theatre, many many times at home, from the television program, from a VHS, Laserdisc, Video CD and DVD... Still, I had never noticed this detail before. Until suddenly, one winter (Dec 4, 2004), a very nice friend of mine who owns a video projector/beamer invited me to spend the night at his place. He suggested I should bring my favourite film to watch together, later in the evening. Guess what I brought. We sat close to the image, on purpose, to be fully immersed in it. And there, face to face with the 3-meter diagonal image I saw her. Mother was here! A picture of Mother on the mantelpiece! Special thanks to EVL. I have mirrored and magnified the original image to allow you to read the stickers. After years of hesitation, I have finally been confirmed by several US-based friends that they were genuine 1962 Massachusetts stickers. The sticker on the windshield was used in combination to the license plate, in order to prove that the car was dully authorized on the road in 1962. This is because the new plates were issued every other year and not every year. It makes sense: although shot in the UK, the action supposedly takes place in the USA, and starts in Boston, Massachusetts. The licence plate of Eleanor's small car reads "F3251". Does it mean anything special? FDAJ. FDAK. FDAL. FDBJ. FDBK. FDBL. FDCJ. FDCK. FDCL. FEAJ. FEAK. FEAL. FEBJ. FEBK. FEBL. FECJ. FECK. FECL. FFAJ. FFAK. FFAL. FFBJ. FFBK. FFBL. FFCJ. FFCK. FFCL. I googled it, but the result seems to be the code of a family in a several online genealogy systems. Needless to say, all results lead to a different family. So I am confused. Maybe there is just no meaning at all? Maybe I'm just trying to find a meaning to a meaningless detail. You have seen the movie countless times, probably, so you know that we actually see the entrance, the lobby of Hill House. Just before Eleanor reaches out for her suitcase, we clearly see the left side of the entrance. Afterwards, a panoramic scrolling lets us discover most of the lobby. Most of it... Except for the very right side of the front door. But I recently realised that we actually see this section of the room, when the first Mrs. Crain dies, falling down the stairs. We see it through her eyes (upside down). I just needed to rotate the image (180°). Once you have been told about it, you really cannot miss it anymore: an adult female character is holding the breasts of another adult female character. This is not a children's joke. They are both adult women. To me, it is an obvious lesbian reference. Although it is quite "in your face", only a few people notice it. Is it a reference to the relationship between Theo and Eleanor? If not, what then? Can someone explain this? It's fascinating to realise how ambiguous this simple little sentence can be. First of all, you might have noticed that all the words are capitalized, except the first one: "help Eleanor Come Home". That's unusual and incorrect. We might have expected "Help Eleanor come home!" with a classic capitalization and an exclamation point. Then, when you think about it, it can have several meanings. If it's a message directly addressed to Eleanor herself, it's a plead: "Help (me) Eleanor, come home!". Someone is calling Eleanor for help, begging her to come home. If it's a message addressed to the group, it's an order: "Help Eleanor (to) come home!". Someone is asking the group to facilitate and speed up Eleanor's return home. Someday... Someday I'll have an apartment of my own... in a house with a pair of stone lions guarding the gate. I wonder if all the homeless people feel that way. I haven't any home. I made it up. No apartment, no things. Everything in all the world that belongs to me is in that suitcase and a carton in my car. So you see, there is no place you can send me. Since Eleanor does not rent or own any place she could call "home" ; since she considers Hill House to be her new home now, could this message be an invitation for Eleanor to join the spirits of Hill House? I wonder. Have you noticed? The devil is in the mansion. It is not a long scene; Eleanor is running so you might have missed it. But with a still image, there is no doubt about it. In Europe, in the popular tales, the devil is half-animal, half-human with horns. In France, one of his nicknames is "Le grand cornu" ("The big horned"). 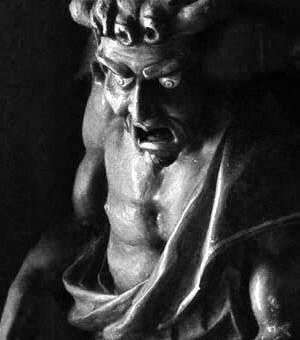 This statue is, without any doubt, the representation of the devil. Now the question is: What is this statue supposed to mean? How come it is in Hill House? 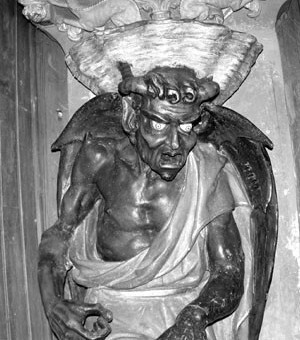 Some of you might be familiar with this representation of the devil as found in the famous church of Rennes-le-château, in France. What? A devil, in a church? Yes, indeed, that is totally uncanny to find one in a catholic church in France. If you have heard about the Da Vinci Code, here is the link: The priest of that church, l'abbé Bérenger Saunière, is the central figure of many conspiracy theories trying to explain how an humble priest in a small remote village could become so inconceivably rich. 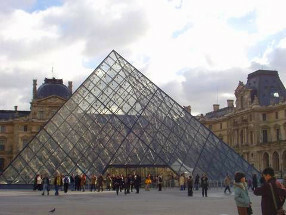 Many of these theories were used by Dan Brown in The Da Vinci Code, in which the fictional character Jacques Saunière is named after the priest. Two heads staring at you... If you are standing where they can both look at you, they freeze you. This is a legend, but how come we can find so many of them in Hill House? Another very interesting example is the nursery doors, where they seem to create a cold spot (see below for details... and more light!). Who is sleeping in the very first bedroom of the first floor? For a very long time I assumed that Eleanor's bedroom was the first bedroom. But if you pay a good attention to the scene when Theo is trying to get in to help Eleanor with her hairstyle, you will notice an open door, leading to a lit room. Have you noticed that there is another room (bedroom?) just across Theo's bedroom; same corridor, with the entrance just opposite Theo's door? Someone must be occupying it because in various scenes, the lights are on or off. We hardly see the furniture inside, but we see the chandelier with 3 light bulbs. The story goes that Robert Wise was asked to install twin beds in Eleanor's bedroom, so that Eleanor and Theo could sleep in the same room without actually sharing a bed. Look at Eleanor's bedroom. That's strange, because, in a usual twin bed setting, the two beds are usually apart, and certainly not that close. Theo, like any adult, has a huge king size bed. Again, a detail I noticed only very recently (2019). It's very incongruous but true: the joyous team dine and have breakfast on an extending table. In other word, the table is actually too small to comfortably accommodate a luxurious table set up for four, so it was extended to a larger set up. It is very visible just below the table top: you can see the extension, and the missing wood panel, looking really "raw" compared to the rest of the deluxe furniture. That's weird, because at dinner time a simple table cloth covered it up perfectly. Another bizarre thing I noticed very recently (2019). There is some light in the fireplace. Light coming from above, from the chimney duct itself. Have you noticed that, although we witness the death of numerous characters in the movie, we never see a drop of blood? All of them are what I would call, "clean" deaths. Robert Wise did it brilliantly; he avoided the tacky "gore" genre and created an "all time classic" movie that is classy, elegant, stylish, chic, tasteful and somehow very sophisticated. Whenever possible, life leaving a character is suggested by a falling object. It is as efficient and certainly much more graceful than torrents of blood. Hugh Crain's young wife died seconds before she was to set eyes on the house. She was killed when, for no apparent reason, the horses bolted, crashing her carriage against a big tree. Her death is represented by her bracelet sliding along her wrist. The 2nd Mrs. Crain died when, scared to death, she felt or was strangely pushed down the stairs. Her death is represented by her keys that fall and that she cannot hold/grip anymore. Hugh Crain died in a drowning accident. Although not seen on the screen, drowning is also a clean death with no blood. The story goes that Abigail Crain died calling for help in the nursery upstairs while the companion fooled around with a farm hand on the veranda. Her death is represented by the stick that falls because she cannot hold it anymore. The companion hanged herself in the library. Her death is represented by one shoe that falls in the void. Eleanor dies crashing her car against the same big tree. It ends where it started with Mrs. Crain. Her death is represented by her wrist, hanging lifeless from the window. The first and second Mrs Crain, Abigail, the companion and finally Eleanor: The house only kills women. The only male character of the story died far away from Hill House. Well, it is not really a "ménage à trois". It is just the strange behaviour of Dr. Markway with Eleanor Lance and Grace Markway, his wife. His wife has not arrived yet. He never mentions her existence, and never mentions the fact that he is a married man. And I cannot see any wedding ring. His relationship with Eleanor is just like a shower that runs hot and cold, hot and cold... He never hesitates to have physical contacts with Eleanor. He gives her a hug; he touches her; he caresses her face; he pays a real attention to her problems. Eleanor has got a crush on him and thinks John is also flirting with her. But she is wrong. Strangely, when Grace Markway shows up, he is really not cheerful and jovial with her. He doesn't seem really happy to see her. They have been separated for a couple of days and he doesn't behave like he has been longing for her. He doesn't touch her and she doesn't even get a kiss! He is cold and distant, but polite: he carries her luggage. Instead of spending a night together, like any couple would, he doesn't really insist on spending the night with her and takes her luggage to the nursery, where she will sleep alone. 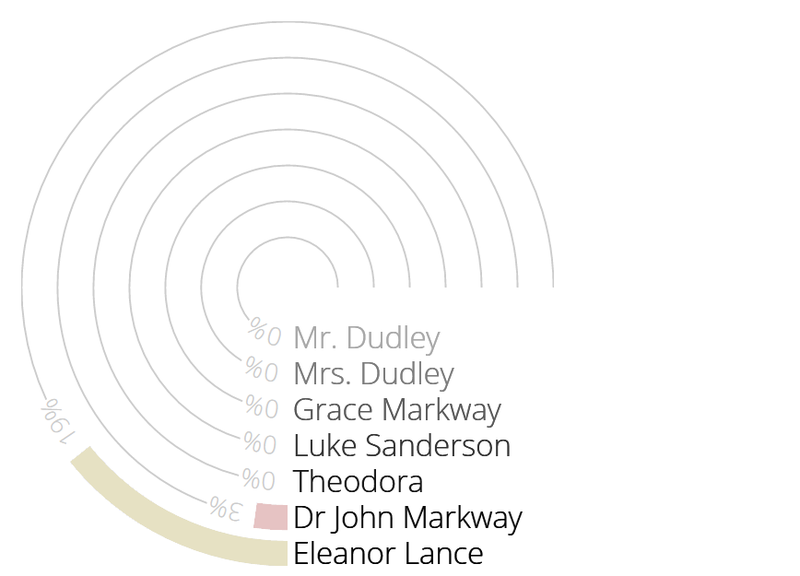 To be quite honest, I have to add that Grace Markway is not more cheerful than her husband. Theo has got a crush on Eleanor. It is the truth and there is nothing wrong with that. Robert Wise expressed this unconventional love in the movie in a very subtle way. The book is much more explicit. In the movie, it is not that obvious but when you add all the passionate looks, all the sweet touchings, all the knowing smiles, it becomes apparent. Robert Wise discarded from the final cut of the movie a scene from the very beginning where Theo and her girlfriend have a row, ending up with Theo writing "I hate you" on a mirror. This scene would have completely changed the tone of the movie. Although I would surely like to see this discarded scene, I am convinced that it was the right decision to make at that time. Claire Bloom plays her part perfectly: Theo initiates a sexual tension that is underlying, permanent and growing all along the movie. Nobody seems to get what they want: Luke is fooling around with Theo; Theo has got a crush on Eleanor; Eleanor fancies John and John loves Grace, his wife. And there is a crucifix in the room. The words Suffer little children can be read on the nursery walls. Suffer the little children to come unto me, and forbid them not. But when Jesus saw [it], he was much displeased, and said unto them, Suffer the little children to come unto me, and forbid them not: for of such is the kingdom of God. Possible interpreration: Jesus offers this instruction to His disciples as though they really needed this clear word to remove any doubt about His attitude about children. The word "suffer" means literally to "let". It would be better read, "Let the little children come". It carries the idea of "being commanded" to "welcome the children to come to Jesus!" Another biblical quote, this time in Eleanor's bedroom, right over the bed: My grace is sufficient for thee. My grace is sufficient for thee [you]. Possible interpreration: I was told it means God's grace is all that we need. She is more than disappointed: disillusioned, marooned and inconsolable. She probably feels stupid and betrayed too. That is particularly cruel: Eleanor doesn't have a lot of self-confidence, and this will probably reinforce the feeling that she doesn't worth anything and doesn't deserve anything. And there are tears in her eyes that she cannot hold any longer. Still, she has pride and doesn't let anyone see or hear that she is crying. Eventually, when forced to leave, Eleanor gently cries in her car. In the book, a beam of light comes from the eyes of the statue. You can notice the light that changes on its face (see the cheeks), but not on the rest of the set. A small creature swallowed whole by a monster! Wouldn't you say that the canopy, suddenly the mouth of a threatening monster, a devouring organism, is about to swallow Eleanor? ... and is still at the same place, decades later, in the same condition, when Grace Markway explores the dreaded nursery! ... and the same plants are still there at the same place nearly a century later! 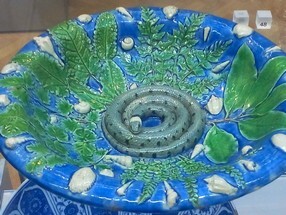 Mrs. Sannerson inherited the cane of the late Abigail. You can see it leaning against her large armchair. She also inherited the silver platter that the companion used when she hanged herself. You can see it on the coffee table, with the cups and the biscuits. When Eleanor takes the car from the garage in Boston to drive to Hill House, she is wearing a white t-shirt with a small knot. Her hair style is perfect and tight, she looks peaceful and well determined. When she leaves Hill House, somewhere much later, she wears exactly the same outfit. Her hair style is undone and untidy. She looks scruffy, tensed and nervous. Was it purposely done? A before and after effect? A sense of closure? Is there another meaning to this? Women (unlike men) do make real efforts to change their outfit every single day. There must be a very good reason to wear the same outfit again. Have a look at these screenshots and reconsider how Grace Markway appears to Eleanor – and only to Eleanor – at the very end of the movie. To me, it is an obvious reference to the legend of the Banshees [attic trap door] and maybe also a reference to the Vanishing hitchhikers [apparition by the tree]. The Banshee is a ghostly lady dressed in white, who appears suddenly to make an announcement about an imminent death. Grace appears very briefly to Eleanor – and only to Eleanor although John is by her side – through the attic trap door, in some form of ghostly white distorted face, as a bad omen announcing Eleanor's forthcoming death. The Vanishing hitchhikers are usually women, dressed in white, who appear suddenly to car drivers on the side of the road – or in the middle of the road – to warn them about a dangerous section ahead, where one or several people died (usually including the hitchhiker herself). Grace appears right by the tree where the first Mrs. Crain got killed in her carriage, in some form of ghostly white silhouette, to warn Eleanor. Seconds later, Eleanor dies at the very same location, against the same tree. Robert Wise gave some thoughts to every single scene in the movie. The fact that he chose to have Grace appear twice to Eleanor truly means something. When you consider the scenes I've mentioned, it is otherwise quite absurd to imagine that Grace got lost in the house, found herself in the attic, opened a trap door she could not reopen to escape, left the attic, got outside the house at some point, and then went straight deep into the park in the middle of the night, instead of seeking refuge near the house. First and foremost, there is the main stairs that lead to the bedrooms and the dreaded nursery. But did you notice that Hill House is supposed to have a 2nd floor? We can see the stairs leading to this additional floor when Eleanor follows Mrs. Dudley to her bedroom. Please also note the wooden arch that leads "somewhere else". When Eleanor stops to look at the statue, we can even see that behind the wooden arch is another flight of stairs, really less luxurious. Maybe one reserved for the staff? Then, when Eleanor and Theo explore the house together, Theo climbs a few steps of another staircase. This is clearly not the main staircase of the house. Compare the decorations at the lower part of the banister. When Mrs. Markway joins the ghost hunt, we clearly see the stairs that lead to the 2nd floor. As she's about to enter the nursery, we can also see another corridor with some stairs (down). Apparently this is where the bedroom of Luke is located (he comes out of this passage when the Dr Markway discovers the "cold spot"). And these are just the wooden stairs of the house. I'm not even mentioning the spiral metal staircase of the tower! Remark: I had to add much light to these screenshots to allow you to see something. I wonder why it took me so long to realise that the "purple parlour" — an important room in the movie, a haven, a safe place to retreat — is referred to as the "little parlour" in the book and never as the "purple parlour". This means that the addition of the colour purple comes from the moviescript, not from the book. 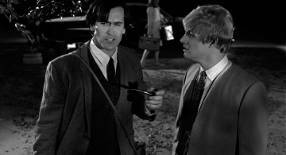 That is indeed quite strange for a movie that was purposely shot in black and white. So I tried to imagine what it could have looked like. Have you noticed? They are everywhere! Now that you know it, watch the movie again, and keep this in mind. You will find a mirror in almost every single Hill House "indoor" scene. In some scenes, several mirrors are present. For instance when the four team members have their very first meal together: there is a mirror behind Dr. Markway and another one behind Luke, reflecting Eleanor and Theodora. It is even more twisted than that: after the first "attack", when they all gather in Theodora's bedroom, the multiple mirrors of the room reflect each other in a very complicated arrangement. It must have been technically difficult to set all this properly. Having a mirror in a set adds a difficulty: you must make sure that nothing "technical" (camera, lights, microphone, crew,...) reflects in the mirror. The mirrors are so numerous in the house that I am forced to conclude that it was purposely done, but what is the meaning? These are just a few examples taken among many, many scenes, and not at all exhaustive! Have you noticed? No wonder that one feels oppressed and observed in Hill House. An army of statues is watching you, watching every move you make, in every corner of the house. I believe it is an artistic choice because these statues are used in a couple of shots in the very foreground. Have you noticed that, on some exterior scenes, we can see lights coming from the house? Rooms that are lit? Or something else? At the very beginning, when we are introduced to the house, a light is switched on upstairs. It is just like an eye, giving you the horrible feeling that the house is opening an eye to stare at you. When Eleanor is eventually forced to leave Hill House, again, some lights: one room is lit upstairs, one room is lit downstairs on the right, and there are some lights from the tower too. Have you noticed that Hill House changed a little bit after all these years? The decoration remains completely identical with genuine period furniture, but still, the miracle of electricity made its way to Hill House too. When Abigail is a young girl, the house is lit by gas lamps and candles. There is a huge gas-chandelier downstairs (where Mrs. Crain was carried lifeless) and another one in Abigail's bedroom (left top corner of this screenshot, the flames can hardly be seen). The rooms and corridors are generally poorly lit with glowing halos of light. When Abigail is an old lady, the house is lit by electric bulbs. In Abigail's bedroom, we can see several electric lamps and chandeliers. The rooms and corridors are now lit by more powerful electric lights. Some long-time fans know it already, but the others might ignore that a special scene with Theodora was shot but not included in the final cut. In this scene, Theodora is having an argument with her girlfriend who is about to leave for a special week-end, presumably with another lover. Theodora writes "I hate you!" on a mirror and smashes some personal objects in the apartment that used to be their love nest. This scene was eventually discarded from the final cut, because it stated obviously the fact that Theodora was a lesbian. Robert Wise decided to let the viewer add the clues and guess. I believe this was a good move: the lesbian couple is not hidden nor denied, but just suggested. This is an important part of Theodora's personality, but it doesn't dramatically influence the story. It just helps to better understand her behaviour. I have been hunting this deleted scene since I heard about its existence, in the early 90s. I was really disappointed that it didn't make it into the 2003 DVD edition. I was disappointed again when the Blu-Ray edition was released in 2013, still without it. 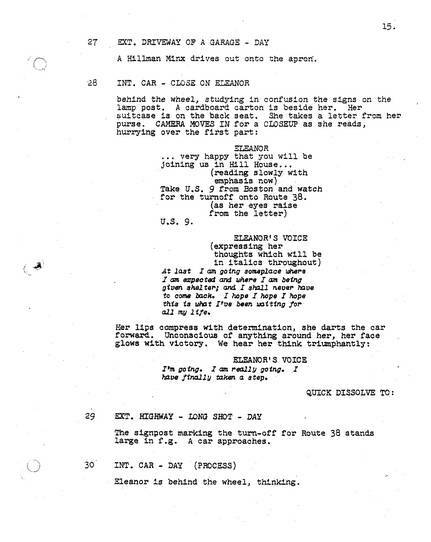 Last but not least, the story goes that the BFI (British Film Museum) has a copy of this deleted scene, included in an 'alternate early cut' of the movie. It would make sense, as the movie was shot in the UK. Original cut of movie (shown 24 Sept 2003 at Filmhouse, Edinburgh, UK) has several differences from the general release print. Alternate opening with voice-over by the Mrs. Sannerson character in place of the Markway monologue. The titles prior to this scene are slightly different. The 'History of Hill house' scene continues into the meeting with Mrs. Sannerson and Markway but in this version, it is Sannerson who is doing most of talking. The following scene from the general release print of Markway listing his subjects on a blackboard is missing. In its place is a scene where Theo throws her lover out her apartment and, next to a photo of her lover, writes "I Hate You!" on a mirror in lipstick, looks at her reflection and mutters "I hate you too...". She then receives her invitation from Markway. This is delivered to her by her landlady who requires the excess postage to be paid. Theo already knows this is to be paid and there is humorous exchange concerning her ESP or her 'gift'. 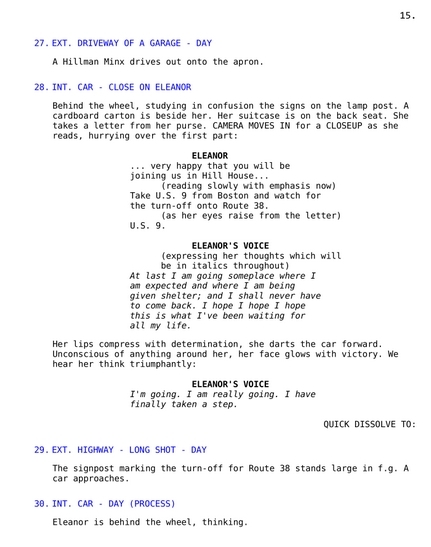 There are several extended scenes involving Eleanor's 'inner thoughts' - most of which tie into her thoughts on her possible relationship with Markway. The scene showing her travelling to Hill house is extended with more 'inner monologue' material including a couple of shots of her turning onto 'route 238' and commenting on "Journey's end in lovers meeting...". The morning/harp scene runs longer and contains more dialogue from both Eleanor and Markway. This print had a title card prior to the MGM logo - "This print is on loan from the National Film and Television Archive"
This main deleted scene didn't sink without a trace. Some promotional pictures were taken during the shooting, and some of these pictures were distributed. I was able to buy some of them (they don't come cheap at all)... What a delight! An intense thrill! In these pictures, you can see Theodora — in rage — wearing a new outfit that was not used in the movie, and more importantly a picture of Theodora's girlfriend. I don't have much hope but maybe some of you would share some other pictures of this deleted scene with me? 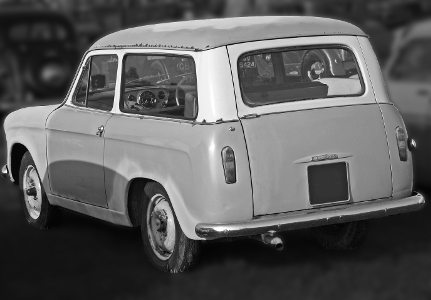 A fine connoisseur and fan of the movie informed me that the car Eleanor is driving is a "Hillman Husky Series II". I have to confess I had never heard about this manufacturer. Although the brand is British, Eleanor is actually driving an American or European version, hence the wheel on the right side. 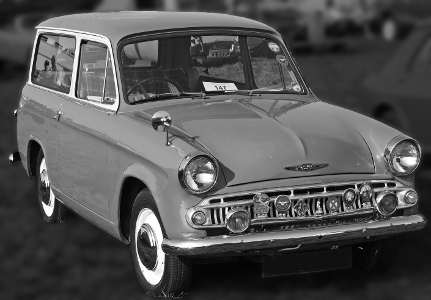 The Hillman Husky was a line of British passenger vehicles manufactured between 1954 and 1970 by Hillman. A "Series II" Husky followed the "Series I" in 1960 with a four-speed gearbox, slightly lowered roof, a deeper windscreen, and altered seats. The engine compression ratio was raised to 8:1 and the carburettor changed to a Zenith 30 VIG type. I invite you to read all the details on the Wikipedia site. 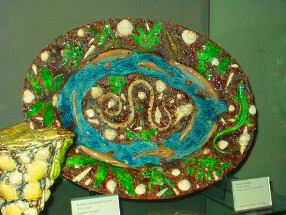 Theo, who is an artist herself and probably an art connoisseur, recognizes immediately the work of Bernard Palissy. 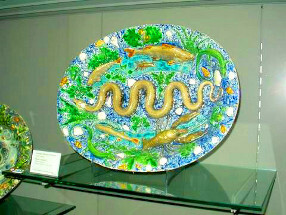 Bernard Palissy (France, 1510-1590) is the most famous figure in the history of French ceramics. 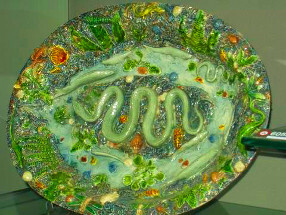 One of the most characteristic aspects of his work can been seen in the large dishes decorated with reptiles, shells and plants cast from life. 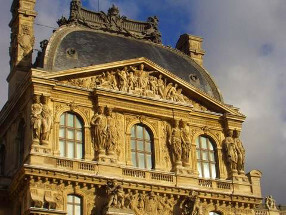 Well, on Dec 12, 2003, I went to Paris with a couple of dear friends for a xmas shopping week-end. 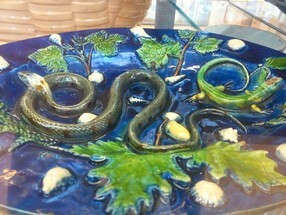 On Sunday, we had planned to go to Le Louvre to see some Palissy... We indeed found them. I must admit it is really strange to see the real objects, it is so realistic it looks almost alive. Please find below some pictures taken that day. 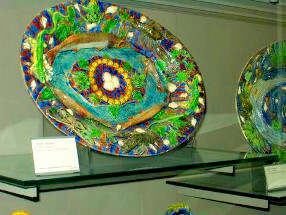 In early November 2016, a dear friend (EVL) visiting the Victoria and Albert Museum in London took additional pictures of superb blue Palissy plates! 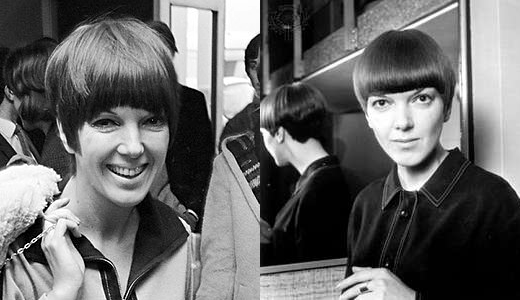 Theodora's clothes are designer's clothes... and a very famous one: Mary Quant! It makes totally sense in the movie. Theo is supposed to be a trendy, urban, fashionable girl; whilst Eleanor is supposed to be socially isolated with limited budget to dress up with designer's clothes. Dame Mary Quant, 1934-, British fashion designer. After opening her boutique in London to sell clothes, she began to design them as well. She was one of the originators of the Mod or Chelsea look of the 1960s that helped make London the new center of fashion. Her designs included miniskirts; vinyl boots; dresses with striking geometric patterns and strong colors; and the wet look achieved by tightly fitted vinyl clothing for a young and avant-garde clientele. This is Theodora's outfit when we first meet her. This picture (left) doesn't appear in the movie. It was released as promo picture and also appears in the MGM Exhibitor's Campaign book. See this outfit in the movie (right). This slight variation of the previous outfit — this time with a long-sleeve coat — is not seen in the movie. These pictures do not appear in the movie. They were released as promo pictures. The one on the left also appears in the MGM Exhibitor's Campaign book. The one on the right also appears in the 'stills galerie' — bonuses — of the Warner DVD. This is Theodora's outfit when she shows up for breakfast. The black is chic haute-couture but also a bit aggressive. When they share a single bedroom together, Eleanor and Theodora are both wearing their nightgown. I assume Theodora's one was a Mary Quant design. This picture does appear in the movie. This is Theodora's outfit for the final scenes. 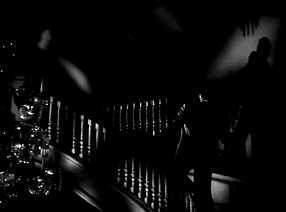 After John rescues Eleanor in the spiral staircase, he decides that Eleanor has to leave right away. Theodora got dressed up very quickly and packs Eleanor's suitcase. This is the outfit she wears then and up until the end of the movie. I assume that is was a Mary Quant design. Although it should appear first in this list, there is also the outfit used in the (deleted/unused) "dispute with girlfriend" scene. Chronologically, this scene was supposed to be part of the presentation of the characters, at the beginning of the movie. It was going to be the first scene with Theo on screen, at home, with a special outfit. I can't say for sure whether it was a Mary Quant design or not: It was released as promo picture but doesn't appear in the MGM Exhibitor's Campaign book, nor in the movie. So, I cannot find any credit about the outfit. Have you noticed? The house is full of genuine expensive period furniture. The MGM Exhibitor's Campaign book gives all the details about the remarkable pieces that are present in the house (or, more precisely, on the set). The most expensive item is a "gilded Adams chandelier" valued at $1,400 (in 1963, $11,600 in 2019). The team responsible for the design of the set has really made a fantastic job! The house really looks like an old Victorian house owned by a wealthy man. An article from Kine Weekly (Dec 6, 1962) elaborates that Claire Bloom discovered Victorian period furniture at an antique fair in Chelsea; furniture that has been used to decorate interiors for the movie. I invite you to visit the Books section for all details. Well, I have to admit that the movie comes with a few continuity glitches. But how can we blame them? Nothing too serious anyway, just a few tiny details you will hardly notice, until you are told about them. The Polaroid instant camera had been invented but its use to keep track of continuity during filming was not at its peak yet. Consequently, a notepad was the only tool available; an eagle eye and a lot of patience was required. Clothes, lights, actors' positions, candles height, doors, props presence and position, hair styles, cigarettes, how to make sure everything remains identical in-between takes? Your favourite film or your favorite movie? The movie and the story are set in the US, near Boston. However, the movie was actually shot in the UK, since the MGM studio near London could produce the same result for a lower budget. Some typical tiny English details surreptitiously infiltrated in the movie. Are these two English policemen (two Bobbies) near the exit of the garage located in Boston, US? The house is "to let" but should it be "for rent" in the US? You noticed it was partially shot in studio, but did you notice the rest? After the gates, Eleanor has to drive a little bit through the park to reach Hill House. The following sequence was partly shot in studio. But on the next sequence, the House is exactly in front of her, not on her right side anymore. This is normal: this sequence was shot in exterior at Ettington Park, where the road came right in front of the main entrance of the house in 1962/1963. It is just logical. This fact is verified at the very end, when Eleanor takes her car and runs away. She is in front of the house and drives right in front of her. She doesn't turn to leave the house. Ironically, nowadays (2019) the old road in front of the house (Ettington Park) still exists, but cannot be used anymore. It leads to a rusted metal bridge (over troubled water), which began to fall apart, literally in pieces. Instead, when you leave the main entrance of the house, the road goes to the right. Eleanor could not have come from the left because there is simply no road but a beautiful lawn. Can you explain why Eleanor's dark blouse with a big knot turns to bright white when she leaves the corridor for the dining room? I had recently a very interesting discussion about this topic with an American fan who shared a very interesting theory. I didn't realise that this type of change could be due to a colour lightning (see below), or simply due to the use of coloured lens filters. If you use a blue filter for a black & white film, then skin tones look dark and reds look dark. However, if you use a red filter, then skin looks smooth and white, and red clothes look white. The assumption is that it is a pink or red blouse and that Robert Wise used a blue filter on the first shot and a red filter or no filter on the second shot. Wait a minute. Have a look again at these screenshots taken from the same scene. When the camera makes a close up of the mirror, we see the ladies in bed, but nothing between the bed and the mirror. A few seconds later, with a wider view of the bedroom, we clearly see that there is a table and lamp, between the mirror and the bed. It should be reflected in the mirror, right? Unless, of course, the table was removed to make room for the camera making the close up of the mirror. I believe that this is what happened. Indeed, this close up of the mirror is the start of a panoramic scrolling view of the bedroom. This probably required heavy camera and machinery. As Eleanor enters the dinning room to have a breakfast, we can see in the background a dark wall with a lighter zigzag motif. But 5 seconds later, with a different camera position, the colour of the same wall is really different. The zigzag motif disappeared and the whole panel looks lighter and brighter. What happened? There could be several explanations for this. I don't believe the wall was changed in any way. It could be a different roll of negative film, which reacted very differently to the same colour. It could also be for instance a colour lighting: if you light up a blue motif with a blue light, the motif disappears. If you light up a red motif with a red light, the motif disappears. They might have changed the lighting between the two shots. That is really what I think happened. If you look closely at the first motif, you will notice that a lamp on a nearby table makes a shadow on this wall and in this shadow, you just cannot see the zigzag. Then 5 seconds later, the wall looks completely different and the shadow of the lamp is gone too. 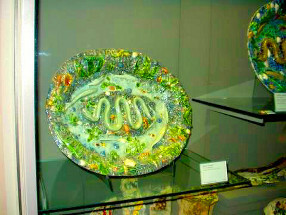 See how this sample colourful motif reacts under different lights. Right and Down: same as above, converted to black and white. Can you see for yourself how this same motif looks totally different under different colour lights when converted to black and white? ...and then suddenly in his right hand, noticeably shorter. The fire is intense when Luke enters the purple parlour, looking for a drink..
... but almost extinguished less than 10 seconds later. It's easy to figure out why: try to pause the filming to set up a 1962 camera in front of the coach with the girls, and see how long it takes. That one is so obvious, you can't have missed it. This is a small continuity problem, but a highly noticeable one: on these two screen shots, the sky is dark grey and suddenly becomes "milky" white. One was shot on regular film (this one), the other (above) on the Belgian infra-red film. When edited one right after the other, the difference stands out. But it doesn't make sense: there is no reason why the colour of the sky should change. 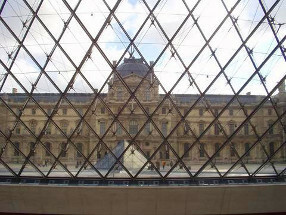 It is supposed to be exactly the same object (the tower) viewed from different angles. Wait a minute. Have a serious look at all these pictures. Eleanor doesn't sleep in her bed, but in a meridian sofa. This sofa is leaning against a wall; behind this wall is the corridor that leads to all the bedrooms and the nursery. The meridian sofa is (obviously) asymmetric. There is a place for the head, and another for the feet. Close to the place for the feet, against the same wall, stands a French door with curtains. Before the threatening figure appears on the wall, we have a look through this French door. We can see outside of the house. This is a view of some towers. But that's just impossible! The outside world is behind the opposite wall, behind Eleanor's bed, where Theodora is sleeping! There is an obvious inconsistency here. The first night, when all the guests part to go to their respective bedrooms, Luke goes to the right when you face the nursery doors. But when later he comes at the call of John to see the cold spot for himself, he seems to emerge from the other side (left when you face the nursery doors, right when you come out of the nursery – this screenshot). When the team leaves the veranda with the life-size statues, they head to a door behind the statues. One second later, as they're about to explore the library, the team enters the house though the main entrance door. But, wait a minute, no! When Eleanor first enters the house though the same door, you can clearly see that there is no veranda nearby. It is obvious with a front view of the house. The body of the first Mrs Crain was carried lifeless in the house, and dropped on this sofa. And ninety years later Eleanor and Theo are still using it. Except, except when they have their coffee after the first diner: Eleanor is in exactly the same room, with the same furniture all around, except the sofa she's seating on which is slightly different. Maybe a cheaper model that could be damaged and stained with coffee? When Mrs. Markway arrives, a room is lit on the ground floor, behind the taxi. A wall lamp is also switched on. A few seconds later, when the taxi is gone, the room is still lit but the wall lamp is switched off. How could this happen? The four team members are outside; Mrs. Dudley is not in the house. Who then? Night or day? Night and day? As Eleanor is hypnotized, mesmerized and irresistibly attracted by the spiral staircase in the library, something strange is happening outside. Although this new event is undoubtedly taking place at night, some windows in the tower are lit like in daylights... whilst some others remain as dark as the night. What is really going on here? This scene is an indoor scene. So it was shot in the studios, and not on location at Ettington Park (See the page dedicated to The House for more details. You will see what is really inside the square tower). So what did happen? Could the technicians forget to check the switches? Did no one on the set notice the strange effect? That is weird. In addition, this scene is definitely supposed to take place during night (Eleanor is wearing a nightgown), so all the exterior lights should be dimmed: the windows are surely meant to be seen, but not with such a bright light. Even at dawn, with the sun rising at East, there should not be such a huge difference between the various windows. Pay attention to the stained glass just above Theo's door. When John and Luke are in the corridor, the stained glass is brightly lit. A few seconds later, as they enter Theo's bedroom, the stained glass is almost in the dark, although the lights seems unchanged in the corridor. Strangely, when Luke hops out of the car to get the keys, he just leaves the door wide open. Seconds later, as Eleanor decides she'll do whatever she wants and leaves abruptly, it is neatly closed. Eleanor, answering the obscure call from the house, flees from one room to the other, from one corridor to the other. She then enters the music room, where a mirror falls in her presence. But the mirror doesn't shatter into pieces on the wooden floor. It keeps hanging on the wall. It is not something purely technical or abstract to understand: a camera, just like your eye, can only focus at one distance at a time. That means that it adapts to see sharply the object you are staring at. The other objects that are farther away will be blurred, as well as the closer objects. Imagine a fly on the window. If you stare at the fly, you will see it sharply but the trees in the garden will be blurred. Now if you stare at a tree in the garden through the window, the fly on the window will be blurred. You can only focus at one distance at a time: the fly or the tree. The camera has the same limitation. But sometimes the director would like to see sharply two objects that cannot be seen sharply together in reality. For instance, a scene in the foreground and another one in the background. It seems easy with today's techniques and computer generated effects but in the sixties, it was not... So there is a trick, a technique called "split screen". The idea is to shoot the scene twice, one time with the focus on the first object, and a second time with the focus on the second object. Then all you have to do is assemble the two sharp "parts" to create one single image. You need to be able to draw a line in the image that will be the limit of the split. It is impossible to have a sharp object on this line. A dark part of the image is ideal. Nothing or no one should cross the split during the sequence. It can be done, but it might reveal the split line. Consequently, nothing or no one can travel between the two "parts" during the sequence. A character cannot leave the background for the foreground (or the other way around) during the sequence. Do not move the camera between the two shots. All you can do is set a different focus but that's all. This is the sequence as it appears in the movie. Now think about it: how can you focus on Eleanor and Theo/John at the same time? They are 10 meters away! It is impossible. If you focus on Theo/John, then Eleanor must be blurred. If you focus on Eleanor, then Theo/John must be blurred. Remark: What was happening in the background was not important at all because this part of the image was un-used. And another one with Theo/John appearing sharply in the background. Remark: Again, what was happening in the foreground was not important at all because this part of the image was un-used. Now the trick is to paste these two parts together to create a natural looking result: this image. No. The swinging mirror! To get such an effect, you just need to shoot the reflection of the scene in a mirror, and move the mirror while filming. You can move the camera to get the same effect but, trust me, it is easier with a mirror. Another proof — if needed — of Robert Wise's talent. This scene is absolutely superb and yet easy to set up: As Eleanor moves forwards, the camera moves backwards to keep the distance between them unchanged. So the background becomes blurred; it is normal because it is farther and farther away. The lights are progressively dimmed as well to end up with a complete darkness in the background. Eleanor is disappearing inch by inch into this house! And you get one big distortion in the house as a whole! That's right. With this wonderful not-ready-for-use lens, it is nearly impossible to figure out the exact shape of a room. Your brain just cannot materialize what is really going on in reality. I wonder what kind of effect or meaning this was supposed to add to the scene, but the grass is badly (see the rough decoupage) incrusted in the nightly view of Hill House. It seems that the grass shot during the "most lit" view was cut and reused in the "less lit" view of the house, to make it look "luminous" at night. Did you pay a good attention to that view of the music room? We see it when Eleanor is drifting and running around in various rooms of the house. Did you notice the incredibly high ceiling? Can you see the length of the cord of the chandelier? Well, as a matter of fact, if you add plenty of light on this screen shot, you can actually see the top of the actual set, created with wood. With today's special FX (special effects) and CGI (Computer Generated Images) it is just so easy to create the perfect morphing. Here is a simple and rough one (just 8 intermediate images), created in less than 15 minutes with my own computer. But back in the early sixties, I guess the only available solution was to create this "fade to next image" effect with more or less plausible median (intermediate) picture. Again, with today's special FX (special effects) and CGI (Computer Generated Images) it is just so easy to create a fake "breathing door" effect. But Robert Wise had to use a much simpler — yet as effective — solution: the door is actually built with layers and layers of laminated wood. To make it "breathe", some strong operators/workers were behind the door, pushing it. It was that simple. Still, it is one of the best remembered feature of the movie. Well, well, that a strange balcony! We distinctly see this part of the house when Eleanor first sees Hill House. We see it again when Eleanor flees with her car. So, look attentively: when Eleanor, staring at the tower, gets dizzy (or pushed?) and nearly falls off the balcony, she stands on a balcony that simply doesn't exist in the house. Playing the movie frame by frame, you can even see some "too short be noticed" technical construction details, including a hole with a ladder. I added a close-up. It lasts only three frames or so. You might also wonder: how was the camera set-up? To fully appreciate the movie, it is also quite important to put the film in its cultural and historical context of the time. What was going on when The Haunting was first released in 1963? Which other movies were released that year? What was the predominant movie genre? Who was at the top of the music charts? Who were the book bestsellers? Historically, what was going on in the world in 1963? 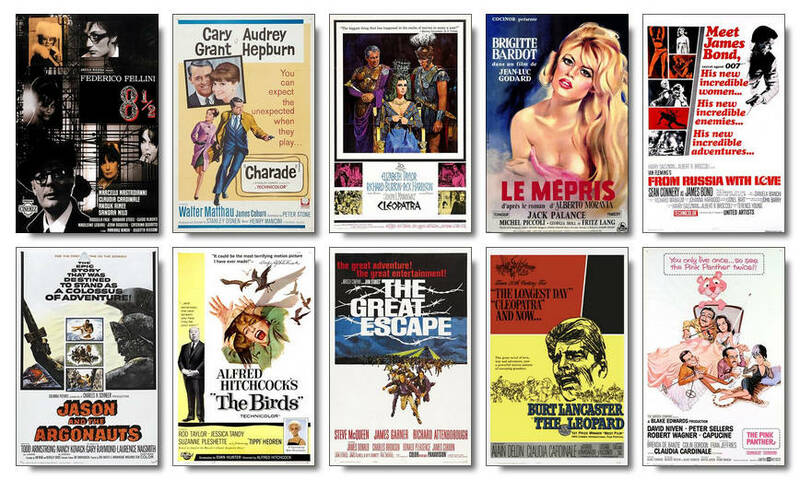 Then, amongst the 2600+ movies and documentaries released in 1963, I selected these 10 titles that are still vividly remembered today. According to IMDb, the non-mainstream horror movie genre was quite abundant in 1963 with no less than 66 movies on the silver screen. The top 5 most represented movie genre in 1963 were: drama (1002 movies), comedy (551), romance (226), documentary (226) and finally action (230). All in all, it was a good time for horror movies. 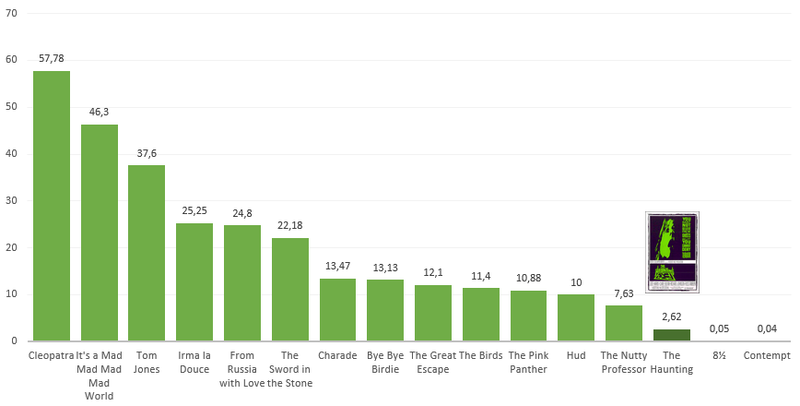 Size of box: number of movies released in 1963, classified by specific genre. According to IMDb, 112 minutes was not the standard running time for a movie in 1963. The standard was more in the range of 80 to 100 minutes. 0 = between 0 and 10 min. † 10 = between 10 and 20 min. † 20 = between 20 and 30 min. ... 210 = between 210 and 220 min. What were the Fiction Best Sellers of 1963? How to summarize 1963 from a US perspective? The biggest news from 1963 was the assassination of the US President John F. Kennedy on November 22nd which thrust Lyndon B. Johnson into the role of president and the murder two days later of Lee Harvey Oswald by nightclub owner Jack Ruby. Mounting troubles in Vietnam where the Viet Cong Guerrillas had now killed 80 American Advisers. "March on Washington," civil rights rally held by 200,000 blacks and whites in Washington, D.C.; Martin Luther King delivers "I have a dream" speech. US Supreme Court rules no locality may require recitation of Lord's Prayer or Bible verses in public schools. Michael E. De Bakey implants artificial heart in human for first time at Houston hospital. Films included "The Birds" and "The Great Escape" and popular TV programmes "The Virginian" and "Lassie". Ladies fashion clothes and hairstyles included fur boots and towering hair do's for evening wear. In music the beginning of Beatlemania after they release "I Want To Hold Your Hand/I Saw Her Standing There" and "Meet the Beatles". How to summarize 1963 from a world-wide perspective? Washington-to-Moscow "hot line " communications link opens, designed to reduce risk of accidental war (Aug. 30). There are 15,000 US military advisers in South Vietnam. Important note: the flags depicted here are the current flags, not necessarily the 1963 flags. Some countries have split, merged, been renamed, so the best effort has been made to accommodate the most appropriate flag. Who were the presidents and heads of government? Instinctively, it is quite obvious that Eleanor is the main character of the movie, with the longest screen presence. However, as scientist, I like facts and figures, so I decided to check. I exported the complete movie into single images, frame by frame, and started to count. Checking who is visible on every single frame would be a maddening task, as least manually. I decided to focus on "logical scenes", instead of single "frames". For instance, Eleanor and Theodora discussing in Eleanor's bedroom is a scene, according to me. During that scene, we might see Eleanor alone (discussing with Theodora, off screen), or Theodora alone (discussing with Eleanor off screen), or the both of them. For that scene, I would record that both Eleanor and Theodora are present - despite the fact that, individually, they might not appear on every single frame of the scene. After cutting the movie into scenes, I did an inventory of all the character who are presents in those scenes, and the duration of the scene, in frames. Of course, if a character enters or leaves during a scene, I have to break down the scene into shorter scenes, to keep an accurate recording of who is actually present and who is not. For instance, after the writings on the wall, the Dr. Markway, Eleanor and Theodora discuss in the dining room. It would seem logical to identify this sequence as a single scene. However, Mrs. Dudley enters at some point and demands to clear up the breakfast, then leaves. So I broke down this scene into 3 shorter scenes: before Mrs. Dudley's entrance, with Mrs. Dudley, after Mrs. Dudley's departure. Obviously, the movie has main and secondary characters. It didn't seem relevant to me to record the on screen presence of absolutely everyone. So I made choices and decided to focus on the characters who live in the house during the experiment: Mr. and Mrs. Dudley, Eleanor, Theodora, Dr. Markway, Luke and Grace. No one likes to read long tables with figures, so I created a couple of graphics that should perfectly illustrate these statistics. 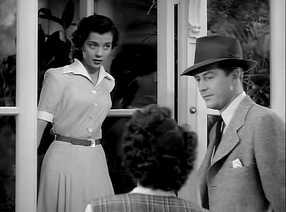 With 84% of screen presence, Eleanor is the undisputed main character of the movie. Surprisingly (again, to me), Dr. Markway and Theodora share almost the same screen presence, with a slight advantage for the Doctor. 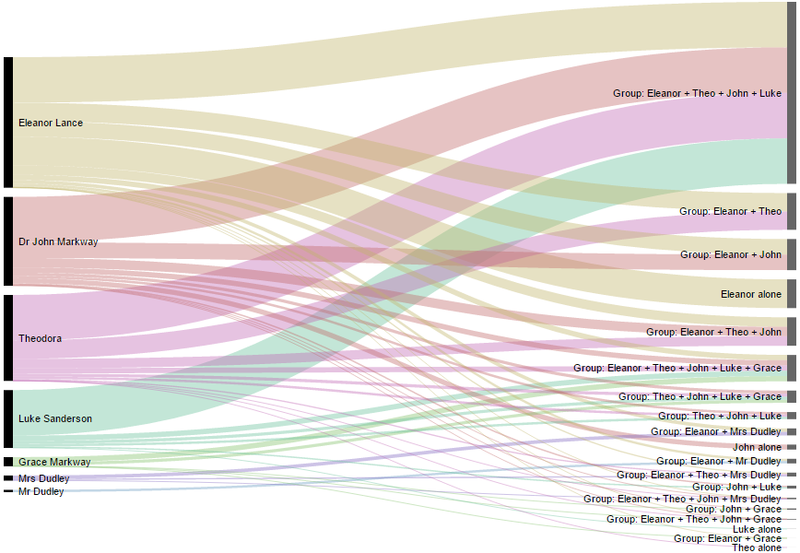 Amazingly (at least, to me), Eleanor is alone on screen for almost 20% of the movie! Characters and Groups: Who is sharing the screen with who? 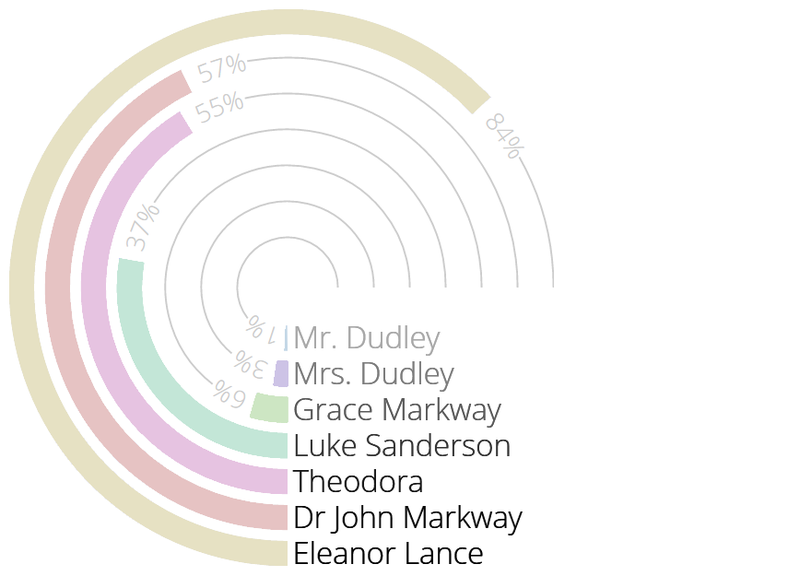 Since I recorded an "inventory" of all characters present in all the scenes I have identified, it allowed me to demonstrate that the most common configuration is Eleanor + Theodora + Dr. Markway + Luke sharing a scene, then Eleanor + Theodora, then Eleanor + Dr. Markway, then Eleanor alone, etc. What would the movie have looked like in colour? Disclaimer: First and foremost, let me repeat again and again that I'm ferociously against the colourization. I love the movie as it is. Period. I'm just waiting for a better 4K or 8K version, with deeper blacks. This movie was shot in black & white, on purpose, as stipulated in Robert Wise's contract. This is an artistic choice of the director and, as such, cannot be questioned. It was his vision; how he envisaged "The Haunting". If Robert Wise had had a bigger budget, he would have not shot in colour – the choice of black & white is not a consequence of a limited budget. I have the greatest respect for Robert Wise and for his, this, masterpiece. Still, I try to keep an open mind. I've been wondering for a while: what would it have looked like in colour? So, with my limited tools and skills (I'm not a professional graphic artist, merely a fan of the movie), I've devoted hours and hours to try to colourize a couple of snapshots, just to get a very rough idea. I hope you can appreciate my approach and the effort it required, just to share with you a "what if…" sneak preview. What does Eleanor feel when she reaches out her hand to get her suitcase and sees her reflection on the shiny wooden floor? What do you think Dr. Markway was about to say to Eleanor when he was interrupted by the harp in the music room? What does Eleanor mean when she looks at the tower and says I wonder what it would be like looking down from there. That's where she did it. From that window. Climbing out through the bars... hanging on for an instant, hanging on...? Why are there so many mirrors in Hill House? Is there a special meaning to this? Why did Abigail never leave the nursery of her childhood? Is this a coincidence that both Eleanor's mother and Abigail died calling for help with no-one to answer? Was the cold spot already there when Abigail was living in the nursery? What is the meaning of the huge marble statue and what does it represent? What is the pupose of the message "Help Eleanor, come home"? To simply scare Eleanor or to convince her to leave (before it is too late)? Is Luke alcoholic or just a young guy enjoying life and parties? What does Eleanor mean when she looks at the tower again — near the end — and says We killed her. You and I, Hugh Crain. You and I. You and I. Why do we see the picture book again at the end of the movie? What is the role of this book in the whole story? What was Eleanor heading for when she climbed up the dangerous spiral staircase in the library? Luke's family owns the house and still, Luke has never been there. How come? Does Dr. Markway realise that Eleanor has her eyes on him? Is Eleanor still a virgin? Was Abigail still a virgin? Why is the name "Abigail" written on the ceiling of Eleanor's bedroom? it is not on the ceiling, it is the cover of the book that Theo was reading, and that she left on her night table before switching off the light. This got me confused for years until I read the movie script. In this scene, Theo is reading a copy of the bible that belonged to Abigail Crain: the name of the latter is embossed on the leather cover. This is the book that Theo insists to show to Eleanor before they start arguing. After the falsely nice "Good night, Nellie my Nell" from Theo, Eleanor — obviously very upset — lays in her bed, and seem to stare at the ceiling for a brief moment. In the next shot, we see a close up of the embossed "Abigail Crain". My brain concluded that Eleanor was looking at something on the ceiling, just above her. The movie editing was misleading. Maybe Eleanor's look at the ceiling should have been cut? Maybe the close-up scene of the book was not enough zoomed out, to see the whole book or the whole night table? It is very difficult to realise that you're actually looking at a night table with a book and a lamp on it. When Theo closes the book, you can see very briefly (and with a wide screen) the embossed name on the cover. Last but not least, I can hardly see the point: why does it make any kind of difference that Theo is reading Abigail's bible? How to enhance your watching experience? This film is so subtle, intelligent, moving, fascinating, captivating, addictive and disturbing... that nothing should spoil your experience. You are absolutely free but just consider this as a friendly advice. Choose a rainy or windy dark evening. Do not spoil it and make sure that everything is perfect before starting. Do not let anything or anyone disturb you: answering machine "on" if you still have a land line, social networks "offline", smartphone "off", tablet "off", computer "off", door "locked". Do not watch it alone. Do not watch it in a crowded room either, your best friend or a friend or two will be fine. You will probably be happy to have someone to talk to when it is over (to share your experience). If you are the kind who nibbles, take immediately the food and drink you need (and go to the bathroom before you start). Do not watch it until it is really dark outside. Do not watch it in a luminous room, that would ruin the experience. Dim the lights. An atmospheric lighting will be fine. The soundtrack, together with the black and white images, has the highest importance in this film. So make sure that the room is really quiet and turn the volume up. Feel cosy and get ready to have a good chill. Just try and you will see that every single detail was purposely chosen. It is definitely a real masterpiece. What are you talking about? Yes. I realise how incredible that sounds, but if you are the lucky owner of a 3D TV able to perform some "on the fly" 2D to 3D conversion, you will be amazed at the result. The crisp black and white image seems to be perfect for that purpose (I had weak and unimpressive results with very colourful movies or music videos). The 3D conversion engine is able to perfectly understand where the background and the foreground are, and to create some depth accordingly. Don't expect to see any object popping out of the TV, it is all about depth. Not just "front" and "back", but a whole range of depth; a genuine 3D perception. If you have the chance to see it for yourself, you will be very impressed to see highly realistic 3D scenes. It works incredibly well in many scenes where an actor is moving in the foreground while the camera also moves, creating a "parallax scrolling effect". Sadly, I cannot make any 3D screenshot to demonstrate this. Wikipedia Pages: In English, in French, in German, in Spanish. Brian's Facebook page "The Haunting: The 1963 Robert Wise film" dedicated to the movie. Another Facebook page "The Haunting (1963)" dedicated to the movie. The Innocents is a 1961 horror film based on the novella The Turn of the Screw by Henry James. Directed and produced by Jack Clayton, it stars Deborah Kerr, Michael Redgrave and Megs Jenkins. Falling into the subgenre of psychological horror, the film makes use of its lighting, music, and direction for its effect rather than gore and shock factor. Its atmospheric feel was achieved by cinematographer Freddie Francis, who employed deep focus in many scenes, as well as bold, minimal lighting. It was filmed on location at the gothic mansion of Sheffield Park, in East Sussex (UK, Europe). The film marked the first film role for child actor Pamela Franklin. In Victorian England, the uncle of orphaned niece Flora and nephew Miles hires Miss Giddens as governess to raise the children at his estate with total independence and authority. Soon after her arrival, Miss Giddens comes to believe that the spirits of the former governess Miss Jessel and valet Peter Quint are possessing the children. Miss Giddens decides to help the children to face and exorcise the spirits. My review: an excellent movie, although I still believe that the decision of Robert Wise not to show anything is the best solution to instillate the fear of ghosts. In The Innocents, the ghosts are seen, which was not really necessary to produce that sense of unease throughout the film. The director perfectly created an eerie feeling that grows and grows during the film. The house is not as threatening as Hill House but the outdoor scenes (in the garden) are superb. The Criterion Blu-ray edition is a must-have! 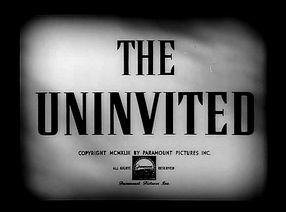 The Uninvited is a 1944 American supernatural mystery/romance film directed by Lewis Allen. It is based on the Dorothy Macardle novel Uneasy Freehold. A brother and sister move into an old seaside house they find abandoned for many years on the English coast. Their original enchantment with the house diminishes as they hear stories of the previous owners and meet their daughter (now a young woman) who now lives as a neighbour with her grandfather. Also heard are unexplained sounds during the night. It becomes obvious that the house is haunted. The reasons for the haunting and how they relate to the daughter whom the brother is falling in love with, prove to be a complex mystery. 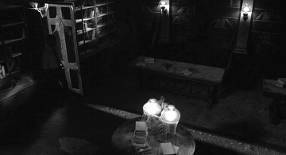 As they are compelled to solve it, the supernatural activity at the house increases to a frightening level. My review: maybe I am just too demanding but this one was really disappointing to me. The romance part of the movie plus a lot of easy tricks didn't convince me at all. Still, if you want to give it a try, don't miss the Criterion Blu-ray edition! Waxwork II: Lost in Time, directed by Anthony Hickox, pays a not-very-subtle but funny homage to The Haunting, with numerous sequences in black & white, and characters who strangely look like the cast of the original movie. See for yourself! If you have not seen it, lucky you! Do not change a thing! If you have seen it, now you know that making a good movie requires talent whilst making a awfully bad movie just requires a lot of money. The one and only positive side-effect of this abominable remake was that the Shirley Jackson's book was reprinted in 1999 with a new cover in numerous countries, in various translations (the English editions were always widely available). Frankly, there is not much to say. It looks like a licensing deal: the permission to reuse the name of The Haunting of Hill House and its characters for something very different from the original book and film. Again, a positive side-effect is a revigorated attention for the original movie and book.